FLIR One gives your iPhone thermal vision, their first mobile accessory, the FLIR One thermal imaging camera for iPhone 5/5s. 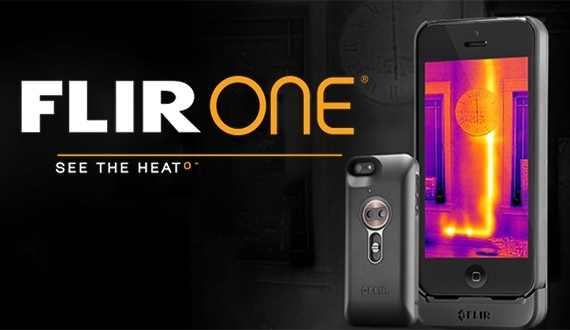 This high-tech case attaches directly to iPhones to bring thermal imaging to your mobile device. It plugs directly into the Lightning port and feeds real-time thermal images into its free iOS app. It looks a lot like a battery case, making your iPhone 5 or 5s about twice as thick. The FLIR One uses long-wave infrared to detect anything hotter than absolute zero. Most contractors know FLIR for their high end hand held thermography units. Now roofing contractors can get access to an entry level unit to test and to use on smaller projects. Technicians can use the pocketable device to locate water leaks source and overloaded circuits. Just another tool for the TechToolBelt, the FLIR One is up for pre-orders now, with a retail price of $349. The company expects shipments to go out later this year. Find out more information go to FLIR One. Copyright © TechToolBelt 2014, All Rights Reserved.